This post was updated in November 2018 and originally posted in October 2015. Potato Gnocchi is a classic Italian dish simply made with potatoes, flour and eggs. Perfect gnocchi are like pillowy little dumplings of deliciousness. Serve your gnocchi with a sauce of your choice such as basic tomato sauce; butter and sage sauce; or even a creamy mushroom sauce. The choices are endless! Gnocchi! Just writing this word makes me hungry. That’s because gnocchi is my favorite food in the whole world, next to arancini of course. I have been eating gnocchi my entire life. Gnocchi was a Sunday lunch thing when I was growing up. The huge pot of sauce filled with meatballs, sausage and ribs would be bubbling on the stove-top while my mother was at the kitchen table rolling endless ropes of gnocchi dough. 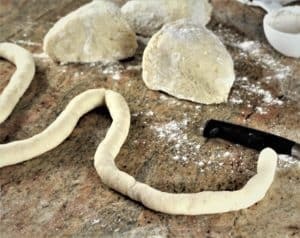 My job was to cut the ropes of dough into individual gnocchi and roll them onto a fork or cheese grater to create those lovely little indentations. At the time, we didn’t have the handy little wooden gnocchi board that we have today. I would fill those baking sheets with the little bundles that we would soon devour. Fast forward about thirty years to a similar scene, only now my children are rolling the gnocchi alongside their nonna or with me in our home. The legacy has been handed down and now my children’s favorite food is gnocchi as well. I’m thrilled! 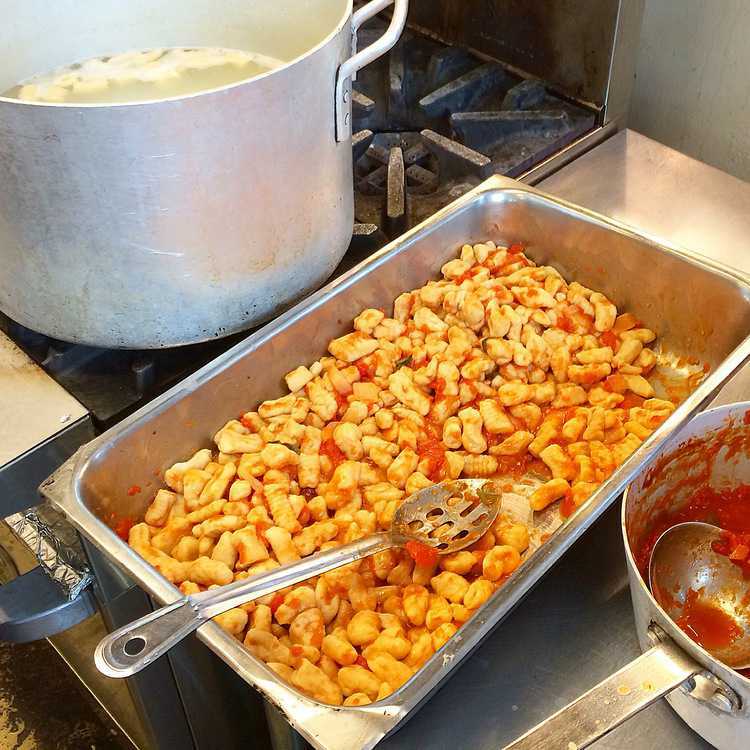 This gnocchi recipe is also what initiated my present career as a cooking instructor. I had the opportunity to volunteer at a local community organization three years ago. My mother joined me in an intergenerational cooking class where we taught a group of enthusiastic participants to make gnocchi. She was reluctant and shy at first, but needless to say she was a natural. 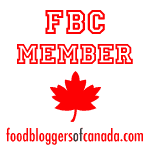 I enjoyed sharing my passion for my favorite foods so much that I decided to pursue teaching. Not very long after this wonderful experience I was featured in a major local French language newspaper’s online edition with a gnocchi making video. This was followed by an appearance on an Italian language television show where, once again, I made gnocchi in front of the cameras. You can view those videos and more on my YouTube channel here. I guess you can tell by now how much I love gnocchi? Now let me show you how easy it is to make gnocchi! Watch my video on how to make gnocchi! Begin by boiling your potatoes in salted water until tender. I recommend russet potatoes as they don’t absorb as much water. Allow to cool just until you can easily handle them. On a clean surface, rice your potatoes using a potato ricer which will result in fluffy, airy potatoes. 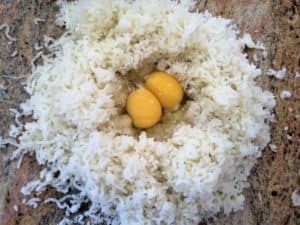 Make a well in the center of the mound of potatoes and add two eggs and a pinch of salt. Lightly beat the eggs with a fork. Sprinkle about 2 1/2 cups all-purpose flour around the potatoes. Use your finger tips to gradually incorporate the flour into the potato/egg mixture, kneading lightly. It will resemble a crumbly mess at first. It should take about 5 minutes to form a smooth dough that is soft but not sticky. Add extra flour a bit at a time if the dough is too sticky. Cut the dough into 4 pieces, dusting the cut sides with flour. Roll 1 piece at a time using the palms of your hands. Use light pressure rolling from the center to the sides in order to create a long, thin rope of approximately 1.5 cm diameter. Cut each rope into approximate 3 cm pieces. 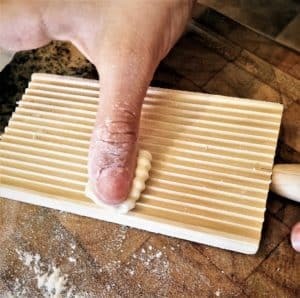 Roll on a gnocchi board by placing your thumb on the gnocchi as shown. 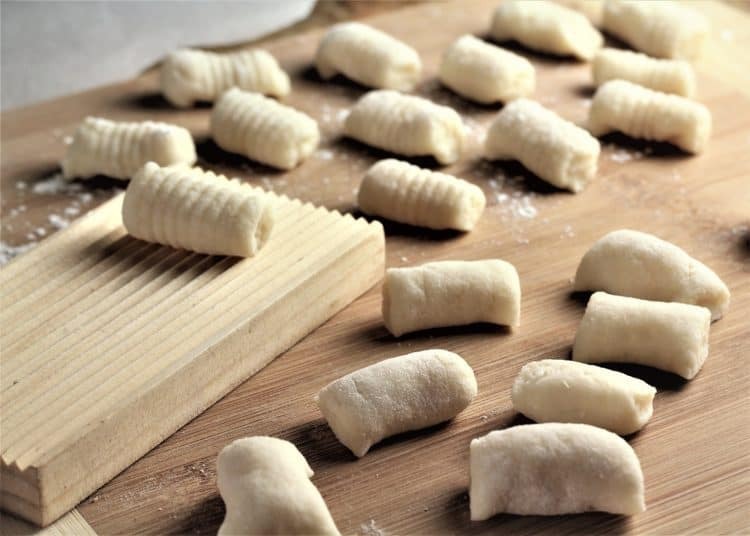 Roll the gnocchi in one movement across the board pressing down lightly in order to form an indentation in the dough. Place on a parchment covered baking sheet and dust lightly with flour to prevent from sticking. Boil in a large pot of salted water until they float to the surface and serve with your favorite sauce and Parmigiano cheese! Traditional pasta dough requires a resting period before rolling. 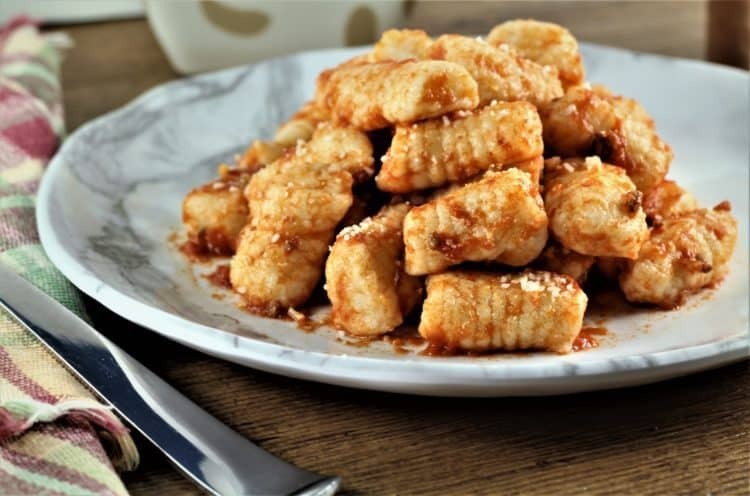 Do not let gnocchi dough rest or place in the refrigerator before rolling, you will have a sticky, mushy dough on hand! The key to making gnocchi is to handle the dough with a light hand, as opposed to bread dough which requires vigorous kneading. 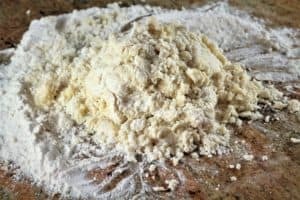 When making gnocchi dough you must gradually incorporate the flour into the potato/egg mixture until a dough which is neither too firm nor too sticky has formed. Don’t fret as you begin this process you will have a crumbly mess of potatoes and flour on your work surface that you think will never turn into dough. Patience! 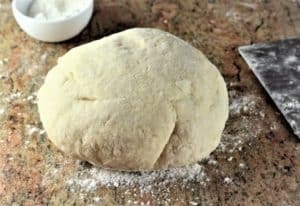 In order to test if the dough is ready for rolling, break off a small piece of dough and roll in the palm of your hands. If it doesn’t stick, it’s ready to roll. Otherwise add more flour. When rolling the dough, if it becomes too difficult to handle as it lengthens, cut in half and continue rolling. Use the tines of a fork or even a cheese grater as we used to if you don’t have a gnocchi board. If the dough sticks when rolling onto the gnocchi board, dust the board with a bit of flour. You can make gnocchi ahead of time, they do freeze well. 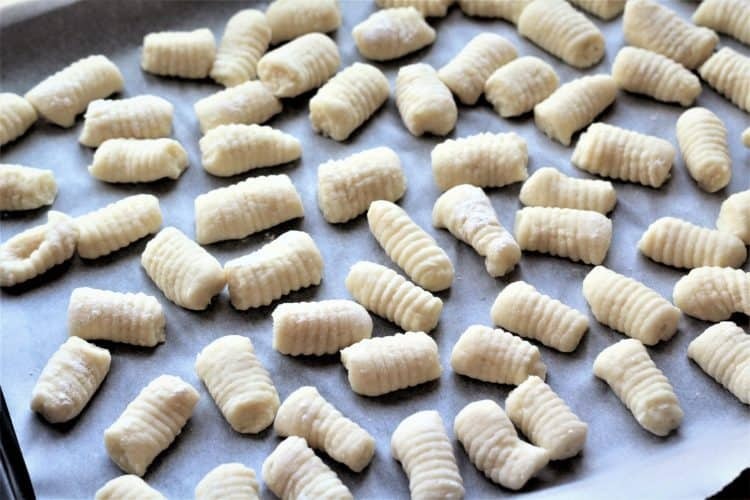 As you shape the gnocchi, lay flat on a baking sheet covered with parchment paper which has been lightly floured. Once they have frozen, transfer them to a freezer bag. Note that frozen gnocchi will take longer to cook. When you dump them in the boiling water, cover the pot until the water comes back to a boil. We always ate our gnocchi with tomato sauce that had simmered for hours along with sausage, meatballs and ribs. However, gnocchi are excellent served with a wide range of sauces. Some of my favorites include basil pesto; butter and sage sauce; and creamy mushroom sauce. Basically, anything goes! Now it’s your turn to make gnocchi! The opportunity to share my favorite recipe with the world has been a wonderful and enriching experience. If you love gnocchi as much as I do, please tag me with your photos with @mangiabedda or #mangiabedda on Facebook or Instagram. Feel free to share this recipe by clicking on the social media buttons on this page! Buon appetito! Potato Gnocchi, especially my mother's, is my favourite food in the world! Finally, I had the opportunity to document her recipe so I can preserve it and share it with all of you. Peel the potatoes and place the in a large pot, cover with water, add salt and bring to a boil. Cook until tender, about 40 minutes. Drain well and allow to cool slightly. 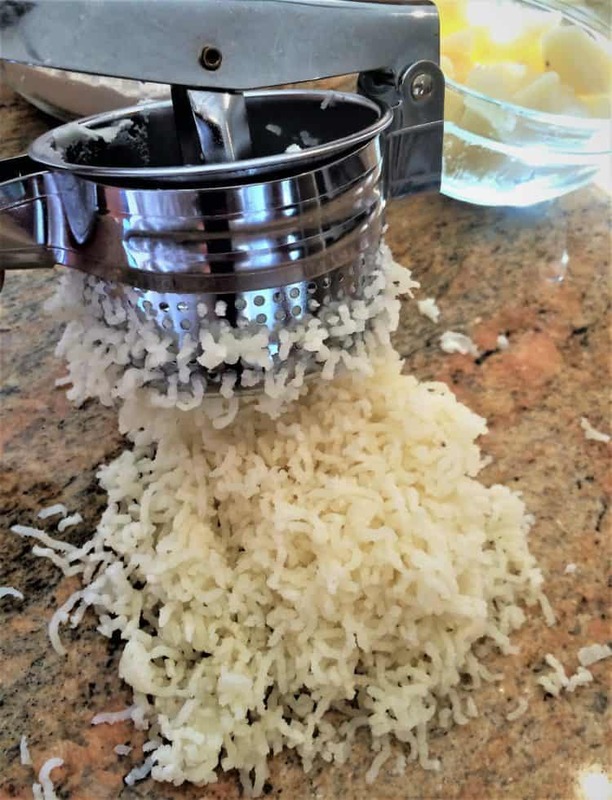 Using a potato ricer, rice the potatoes directly on your work surface. 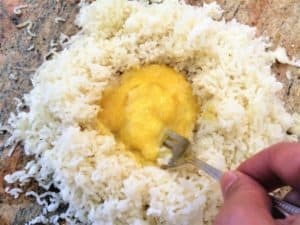 A ricer will give you the best results but if you don't have one, mash the potatoes lightly with a fork, You want a light and fluffy consistency. Make a small well in the centre of the potatoes and add the eggs. Add a pinch of salt and beat lightly with a fork. Sprinkle 2 1/2 cups of flour around the potato mixture, in a circular fashion. With your fingers, gradually begin incorporating the flour into the potato mixture. Add flour until the dough is no longer sticky. You may not need to use all the flour. The dough must remain light and airy, therefore knead with a light hand. The mixture will be very crumbly at first but as enough flour is added, a dough will form. In order to test for readiness, take a small piece of dough and roll it between the palms of your hand. If it is too sticky, add a bit more flour. Cut the dough into 4 pieces. Using the palms of your hands and by applying gentle pressure roll the dough into a long rope about 1.5 cm thickness. If the rope becomes too long to roll easily, cut it in half and continue rolling. Cut the rope into approximately 3 cm pieces. 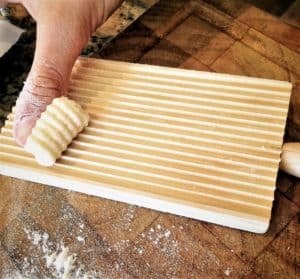 Using a wooden gnocchi board (or the back of a fork or the small holes of a cheese grater), place your thumb on the gnocchi and gently roll across the board in order to form an indentation. 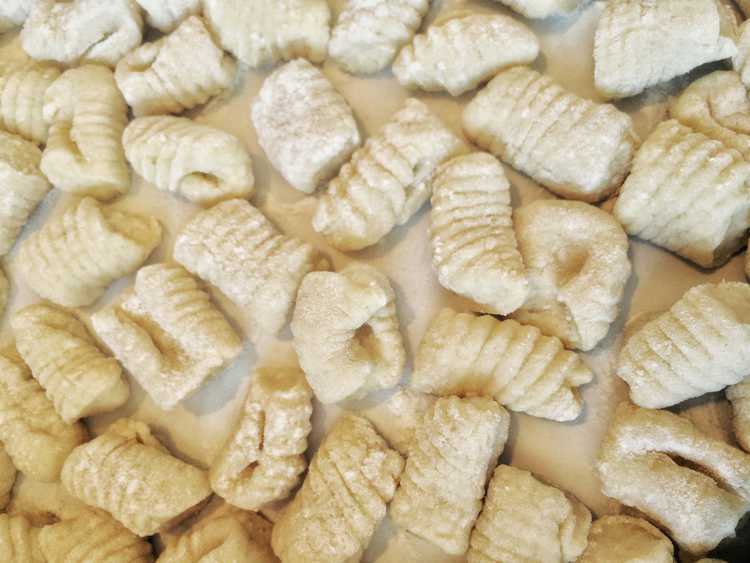 Place the gnocchi on a baking sheet covered with parchment paper that has been lightly floured. Repeat with the remaining gnocchi dough. If cooking immediately, bring water in large pot to a boil and salt. 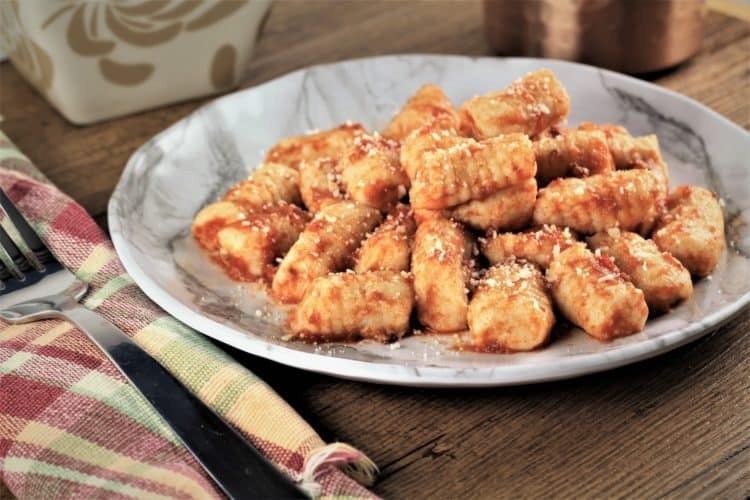 Drop gnocchi into the boiling water, stir gently and once the gnocchi have come to the surface, drain well and serve with your favorite sauce and Parmigiano cheese. 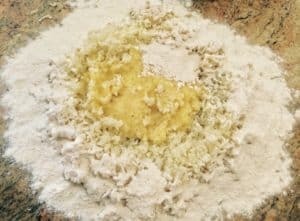 Don't fret as you begin this process as you will have a crumbly mess of potatoes and flour on your work surface that you think will never turn into dough. Patience! In order to test if the dough is ready for rolling, break off a small piece of dough and roll in the palm of your hands. If it doesn't stick, it's ready to roll. Otherwise add more flour. If you don't have a handy gnocchi board, use the tines of a fork or even a cheese grater as we used to. If you want to make gnocchi ahead of time, they do freeze well. As you shape the gnocchi, lay them flat on a baking sheet covered with parchment paper which has been lightly floured. Once they have frozen, transfer them to a freezer bag. Hi Marisa, thanks so much, that's so sweet of you! LOVE Gnocchi so much! We use to call them led stinkers! My Grandma made the best. I've tried make them and they dissolved in the boiling water?? Also I dont have a ricer Any suggestions? I did make pasta this weekend and it turned out great! Hi Cynthia, I’m sure your grandma’s gnocchi were delicious! It’s hard to say why yours dissolved. Was your dough too soft? Perhaps the dough has to be kneaded a bit more? As for the potato ricer, if you don’t have one I would suggest you lightly mash the potatoes with a fork. Avoid a potato masher as the potatoes will become too dense instead of light and fluffy. Hope this helps and thanks for stopping by my blog! Hi Marci, I'm so glad to hear that and I also saw your photo, they look great! I'm glad you found my video and post helpful. As you can see gnocchi is not too difficult to make as long as you handle the dough carefully. I tend to reserve some cooking water when I make pasta to thin out a sauce as needed, so I definitely think that would be a good idea when using pesto. That sounds delicious! Thanks for sharing this with me Marci!